Fresh off forming a board of directors and incorporating as a nonprofit, the Tool Library is embarking on a strategic planning process and needs your help! How can we build a stronger, more inclusive Buffalo with shared tools and resources? Share ideas and brainstorm ways the Tool Library can continue to empower neighborhoods and provide communities with the tools they need to create the change they want and how you can help. Help us get the word out by sharing our flyer! 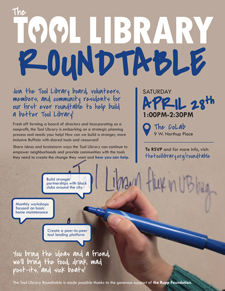 Our Tool Library Roundtable will take place on Saturday, April 28th from 1-2:30PM at the CoLab (9 W. Northrup Place). Tool Library board members will be facilitating different interactive stations for you to provide your input and feedback. You bring the ideas and a friend and we’ll provide great food, drinks, company, and ambiance! Please RSVP by filling out the form to the right. Can’t make the Roundtable? Fear not! For those who are unable to join us on the 28th, please us the online form above to submit your feedback electronically. We’d like to hear from as many people as possible! Thank you to everyone who made our first ever Tool Library Roundtable a smashing success! Click here to read the feedback we received at the event. The Tool Library Roundtable is made possible thanks to the generous support of the Rupp Foundation.